Elmo, love the Goodman analysis. A good friend of mine is infamous for putting down kingburgers with egg and chili like he was eating skittles. Well, probably doesnt hurt that he's 6'4'' and built like a professional athlete. ...your post with the photo of the big juicy fatburger. and all i have here at my desk is trail mix. which ain't gonna cut it. Long live Fatburger! Anybody know any management there? We need one in Temecula. King Fatburger on the Char, No Mayo, no relish......totally delici-yoso!!! We used to go to the Brea location all the time! Oh, and one order of fat fries, one order of skinny fries - you had to give equal time. Bad thing is, that Fatburger here in San Diego, isn't as good, as strange as that sounds. Now your killing cows, elmo? Does your treachery know no bounds? Great review and I adore Fatburger. A regular burger with everything (including an egg), hold the tomato, and a batch of their onion rings and I am a happy Seth. Yummy. Glad you posted about them. I think Fatburger often gets overlooked and it is one of my favorites. the ole' babyfat it, so you don't feel guilty trick! i use that one at F.B. all the time!! have you tried any of em lately? Egg and chili? On a Kingburger? That's so insane, it's genius! Never been to Fuddruckers, but have heard impressive things about it. Definitely on my list. Happy to illicit envy! Even though the patty isn't visible in that photo, it lurks and waits, using the egg as bait. You know what? I thought it was just me. I ate at the Fatburger in Horton Plaza in SD once, thought it wasn't good, but chalked it up to bad timing...I guess quality does vary by location. Chicken ovums and cattle were harmed in the process of this review. AND MAN were they GOOD! Was close to trying Roma Di Italia last Saturday. I have to check out Me N Eds and Pizza Haus...the name sounds intriguing already. I like the bacon and avocado they add on Farmer Brothers hamburgers. ... Every type of cholesterol under one bun... Now that's what I call a burger! Also, in AZ, they used to have this place called Whataburger. Great stuff. Nothing beats the hamburger/cheese/egg combo. Nothing! :( Wish they have a Fatburger and Carl's here. Thin crust is the only way to go for me. Thanks for the rec. We take eighteen ounces of sizzling ground beef, and soak it in rich, creamery butter, then we top it off with bacon, ham, and a fried egg. We call it the Good Morning Burger. I'm sure there are burger joints that are just as worthy where you are. But, a fried egg on a burger, now that's rare. Love your blog! Why have I not seen until now. But there are closer locations of Fatburger near you. Brea for sure...I think there's also one in West Covina too. If you make it out to one, remember the egg! I've only been to Fatburger once, and it was so long ago I can't even remember what I had or if it was any good (the one by the Palladium in LA while waiting to get into a Jane's Addiction concert). Your post has definitely put it back on my radar! Thanks, monster! Had to hit up the Orange location for lunch today. King Burger w/cheese & an egg! All your fault. Hope when you try Fatburger again it will be as good as you remember (or don't remember as this case may be)...as Kirk says though, quality seems to vary by location. Glad to be of service. I'll happily take the blame if it means you had a tasty burger! Did you say that there's an option of putting balls in the burger? Oh, I'm sorry. Wishful thinking. 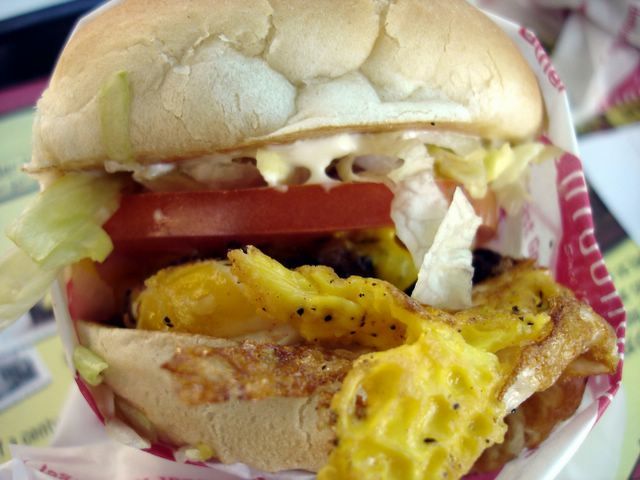 You said it's a ballsy option to put a whole fried egg on your sandwich. Ah, gotcha. Right. definitely stopping here for lunch in orange this week. i thought i was the only one who loved an egg on a hamburger. Sounds like someone's having flashbacks of those Rocky Mountain Oysters it seems. HA! I think a better question would be "Who WOULDN'T love an egg on a burger?"...Enjoy! And thanks for visiting my blog! You know, I work near the Aliso Viejo Fatburger, and I go in there on occasion when I'm in the mood for a good burger, and yet, I've never tried it with an egg. Next time, I'll do the Mini-Fat with an egg, like you mention. And the onion rings. I like the fries, but the onion rings have my (artery-hardened) heart. Those onion rings and egg add-on will be the death of me. I'm glad I have to go out of my way to go to Fatburger. It's not on my route home from work. This fact probably saved me at least one coronary bypass. Fatburger is delicious! I remember coupons floating around somewhere too. I -love- their thick fries. Sadly, I think the Michelson location may be closing to make way for more parking for the newly built condos of that area. The one on Michelson is still open despite the theatre being nearly destroyed now. I went there a couple nights ago and there was no sign of it closing down anytime soon. Also, their chili cheese fries are excellent.